OPRA Requests - Please contact Marilyn Regner, MCMUA records custodian, to request public information in accordance with the Open Public Records Act. Her Email is mregner@co.morris.nj.us and her phone number is 973-285-8385. MCMUA Board Members - This is a membership listing of current MCMUA Board. 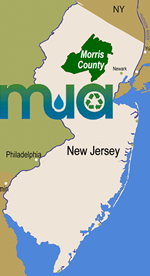 Mission and Responsibilities - The MCMUA Solid Waste Division implements recycling, solid and hazardous waste programs throughout Morris County. The MCMUA Water Division sells drinking water to several municipalities and water companies. Authority, Rules, Regulations and Official Policy Statement - The MCMUA's website (www.MCMUA.com) contains the MCMUA's rules, regulations and policy statements deemed relevant by the MCMUA to the interests of Morris County, NJ and the MCMUA's service area. MCMUA Meeting Minutes - Meeting minutes, listed in reverse date order, include verbiage of resolutions adopted as well as any committee reports provided to the MCMUA Board during each meeting. $17,500 Remuneration List - Listing of all attorneys, advisors, consultants, and any other person, firm, business, partnership, corporation, or other organization which received $17,500 or more during the preceding fiscal year for any service whatsoever rendered to the of the authority.